To conclude her three-day Africa visit which also took her to Mali and Niger, German Chancellor Angela Merkel travelled to the Ethiopian capital of Addis Ababa on Tuesday where she was welcomed with military honours. 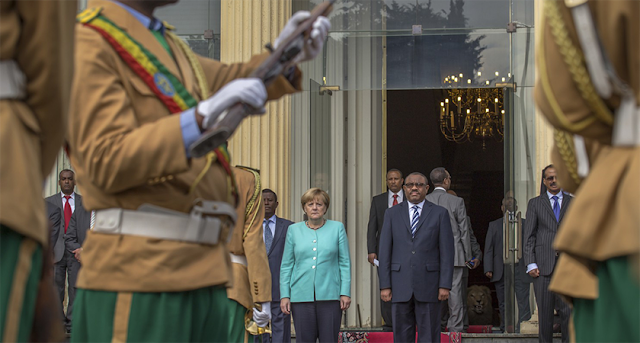 Her reception speaks volumes about the reactionary character of the return of German militarism to Africa. Just two days prior to the chancellor’s visit, the Ethiopian regime declared a six-month state of emergency in order to undertake even more brutal measures to suppress popular protests. On the previous weekend, heavily armed security forces attacked a mass rally to mark the traditional harvest festival of the Oromo people. Fifty-five people were killed, according to official statistics, but opposition sources reported more than 650. Youtube videos showed helicopters dropping tear gas onto the crowd of people and security forces firing into the crowds. According to media reports, the army has shot more than 1,000 people since the protests broke out last November in the Oromo and Amhara regions. The protests are directed against the government of the Ethiopian Peoples’ Revolutionary Democratic Front (EPRDF), which has governed the country in an authoritarian manner since 1991 and brutally suppressed all opposition. The uprising by the Oromo and Amhara peoples was triggered above all by the government’s land policy, which compels impoverished farmers to sell off their land for next to nothing to the state in order for it to be sold off to foreign investors. With a population of 92 million and an average gross national income of $570, Ethiopia is among the poorest countries in the world. The economic growth of the past decade has benefited only a small corrupt ruling elite. The vast majority of the population lives below the absolute poverty level. According to World Bank data from 2015, more than 30 percent of the population in 2011 had to live on less than $1.25 a day. None of this prevented Merkel from meeting with Ethiopian Prime Minister Hailemariam Desalegn and the commission president of the African Union (AU), Nkosazana Dlamini-Zuma. She presided over the opening of the so-called Julius Nyerere building for peace and security, which was funded by Germany to the tune of €30 million, as planned. It will serve as the headquarters for the AU and has a conference hall as well as a store and headquarters to lead military interventions. Merkel made clear the “perspectives” she was talking about in her subsequent remarks. She called for the prevention of illegal migration, caused by Africans “with completely wrong impressions” setting off for Europe. To this end she referred to the migration partnerships with the European Union (EU). Under these agreements, despots like the Egyptian dictator al-Sisi, Sudan’s Omar el-Bashir and even Desalegn himself will receive €1.8 billion from the EU to detain refugees in Africa and keep them away from Europe. While Berlin officially opposed the NATO bombardment of Libya in 2011, it has been pushing more strongly into Africa since the foreign policy shift carried out in 2013-14. This has not only included German imperialism’s traditional spheres of influence during the colonial period, but also those of its historic rivals.